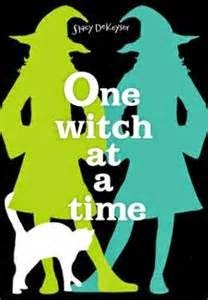 One Witch at a Time, by Stacy DeKeyser (Margaret K. McElderry Books ,February 10, 2015) is an extremely satisfying middle grade reimagining of Jack and the Beanstalk. It's also the sequel to The Brixen Witch (an equally satisfying middle grade retelling of the Pied Piper story), though it can be read as a standalone just fine. Winter in the village of Brixen has bee long and hard...and so it's important that Rudi get good bargains when he goes to town to trade his family's cheese. But the day goes sour when his companion, nine year old Susanna Louisa, makes a bargain on her own--one of Rudi's family cows for the "magic beans" being offered by a strange foreign girl. Rudi doesn't believe the beans are magic...but he's wrong. And it's a magic that's alien to Brixen, and if its allowed to stay, the balance of things will go awry. But there Rudi and Susanna meet Agatha, the strange girl who traded the beans in the first place...and though she agrees to travel with them to the giant's home, she's less concerned about balancing magic than she is with bringing summer back to Petz....which complicates things more than somewhat. Then to make matters worse, Susanna brings one of the giant's chickens home with her to Brixen, and it starts to lay golden eggs....And the giant comes looking for it! It's a good story, well-told, with many little twists on the original adding lots of interest! Like The Brixen Witch, One Witch at a Time is the sort of fairy tale in which magic is slotted comfortably into a real world context, in this case, a historical Bavaria. The strong sense of real place, and the believable characters, makes for very satisfying reading, especially for kids for whom the silly doesn't always work. It's not a wild and whimsical fairytale fun (like The Hero's Guide series, or E.D. Baker's books); instead, I'd give these to fans of Gail Carson Levine's Ella Enchanted and A Tale of Two Castles. But really, what's most important to me is that I enjoyed both the books! (note on the cover--the cover for Brixen Witch tilted perhaps too strongly toward historical fiction; the cover of this one goes off in the opposite direction. It doesn't convey anything about what this book is really about (a Jack and the Bean Stalk retelling in which there are no witches who wear pointy hats). This might make it hard for the kids who will really love it (and I think there should be lots of those) to find it). Disclaimer: review copy of One Witch at a Time received from the author. Thank you for your lovely, review, Charlotte. I'm so glad you liked the book!